A pre-feasibility study unveiled during the recently concluded 7th Annual Meeting of the Nuclear Energy Cooperation Sub-Sector Network (NEC-SSN) showed that many member countries of the Association of Southeast Asian Nations (ASEAN) are in favor of tapping nuclear energy for peaceful or commercial use. The three-day summit, which ended April 19 at the Sofitel Hotel, was hosted by the Philippines with the Department of Energy headed by Secretary Alfonso Cusi as the lead agency in facilitating the conference chaired by Malaysia. Nuclear energy is being seen by ASEAN members as a long-term source of power, according to the study conducted by ASEAN Center for Energy (ACE) Canada’s Nuclear and Radiological Program. 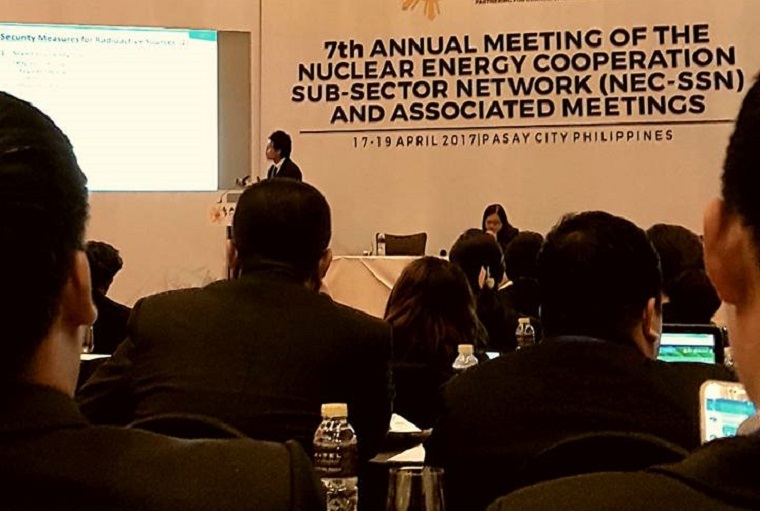 In representing Secretary Cusi, DOE Undersecretary Jess Posadas underscored regional and international cooperation to advance the use of civilian nuclear energy (CNE) in the ASEAN region. In his speech opening the summit, Posadas said the Philippines will need a kind of energy that will power the economic development resulting from the P8.9 trillion worth of investments in infrastructure in the next five years. “Pagnakita mo ‘yung golden age of infrastructure, magugulat ka … Train na lang, electric lahat 'yun. Magkakaron pa tayo ng subway,” Posadas said. "If the infrastructure projects will be built, the Philippines will need huge amounts of energy." Nuclear power has the potential of meeting such huge energy demand, according to Posadas, as he noted that one gram of uranium is equivalent to 1.8 million cubic meters of oil and three million grams of coal. "Nuclear energy would last longer than other fuels," said Posadas. “The Philippines has always viewed nuclear energy as a long-term option for power generation that will provide supply security, stability and reliability. Should this be the path that the country will take, nuclear further diversifies our existing generation mix comprised of coal, natural gas, geothermal, hydropower, oil, wind, biomass and solar,” he said. “Owing to its baseload characteristics, nuclear energy will be in support to the thrust of the Philippine government which is the realization of the Philippine Development Plan’s (PDP) drive for industrialization and urbanization. It is central for a country towards the path of development to have the available and required capacity to meet the nation’s increasing demand requirements,” Posadas added. The DOE official emphasized that discussions on nuclear energy as well as radioactive sources tend to attract issues on security. “We are cognizant of this and must admit that this issue cannot be discounted as people and the environment must always be protected. As you would note, security and physical protection is just one of the 19 infrastructure issues identified by the IAEA for countries pursuing nuclear power development. When we talk about radioactive sources, there is also emphasis on security. There must be a security culture practiced and a system well in place,” he told the forum. Many of the resource persons emphasized that to realize the full potential of nuclear energy, ASEAN governments must come up with clear cut policies, legal and regulatory framework, infrastructure and unstinting support for it through capacity build-up. Malaysia presented its efforts for public acceptance of nuclear energy as the power source carries with it some stigma because of nuclear accidents like Japan’s Fukushima Incident. Malaysia was represented by Mr. Song Wong Tin with the Philippines, being represented by Ms. Carmencita Bariso of the Department of Energy (DOE) as vice-chair. In attendance were NEC-SSN focal persons from ASEAN member states of Indonesia, Malaysia, Myanmar, Thailand, the Philippines and Indonesia, as well as representatives from the ASEAN Centre for Energy (ACE). Also those who joined were representatives from the China Nuclear Engineering Group Corporation (CNEC), Integrated Support Center for Nuclear Nonproliferation and Nuclear Security (ISCN), Japan Atomic Energy Agency (JAEA), International Atomic Energy Agency (IAEA), the European Union Chemical Biological Radiological and Nuclear Risk Mitigation (EU CBRN) and the United Nations Interregional Crime and Justice Research Institute (UNCRI) Centres of Excellence (COE). Teofilo Leonin of the Philippine Nuclear Research Institute (PNRI), 2017 chairperson of the ASEAN Network of Regulatory Bodies on Atomic Energy (ASEANTOM), discussed potential areas of cooperation with AMS on nuclear regulatory. Shi Boxuan of the CNEC, on the other hand, led the contract signing for the Clean Energy Project between ACE and CNEC, and expressed interests in future collaborations with AMS. The NEC-SSN also welcomed and duly noted the initiatives of the EU CBRN UNCRI COE on nuclear protection in the ASEAN region. Ms. Reina Matsuzawa of ISCN/JAEA and Dr. Kusnanto of ACE discussed the productive outcome of the Seminar on Nuclear Security and the Capacity Building on Nuclear Material Transport.